Former Boulder City High wrestler Brandon Foster, a two-time state champion, will wrestle in Las Vegas today through Saturday when Embry Riddle Aeronautical University competes in the Asic Invitational at the Las Vegas Convention Center. Foster won individual state championships in 2012 and 2013 for the Eagles and as a sophomore he lost the title match. In 2012, he won first place in regional and national tournaments in both freestyle and folkstyle in USA Wrestling tournaments. Foster recently defeated Jake Swartz of Boise State, who was ranked sixth nationally in the 184-pound weight class. Swartz later reached the quarterfinals of the NCAA Championships. At the end of the school year Foster will begin serving a two-year mission for The Church of Jesus Christ of Latter-day Saints. Embry Riddle will hold his full scholarship until he returns. Dillon Viera notched eight-place in the Post Season Nationals Tournament at the Riviera March 28-30. Wrestlers from 30 states competed in the event. Viera (160 pounds) was the only Team Boulder wrestler to place, but Devin Fox (160), Nelson Van Diest (182) and Collin Fox (132) each did well. Viera and several other Team Boulder wrestlers also did well in the in the Westlake (Utah) USA Wrestling Regional Tournament last week. 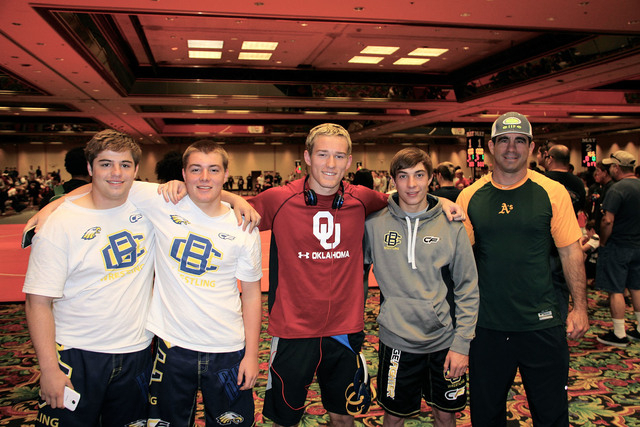 The event featured wrestlers from Nevada, Utah and Wyoming. Brady Branscum (108) placed first in folkstyle and second in freestyle, while Jimmy Dunagan (105) was second in folkstyle and third in freestyle. Garrett Leavitt (180) was third folkstyle and won first place in freestyle. Bryan Foster (138) was third in both styles. Viera was fourth in folkstyle and teammate Jake Jurgschat (195) was second in freestyle. Van Diest (188) placed first in freestyle and was runner-up in folkstyle. Colin Fox was first in freestyle and second in folkstyle where he beat a Utah All-American at 125 pounds. Dustin Edlund (170) was second in folkstyle and third in freestyle. Devin Fox placed second in both styles. “The kids are working hard this off season and they are getting a lot of mat time experience and that builds their confidence,” Team Boulder coach Jim Cox said.